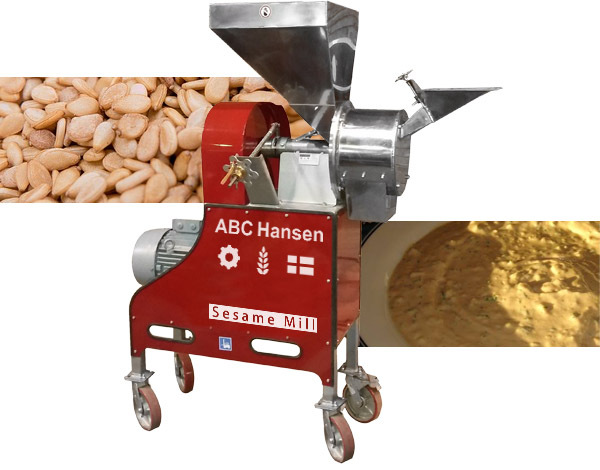 Sesame seed paste may be produced by milling decorticated sesame seeds in a Universal mill with plate attachment. Sesame has one of the very highest oil contents of all oil seeds and whole seeds are used the world over in baked products and in snacks such as the peanut brittle. Tahini (sesame paste) is used in various ways such as in hummus bi tahini in the Middle East and in the sweet confection halvah. In Japanese cuisine goma-dofu is a confection of tahini and starch. Sesame paste is also used in some nougat confections and is mixed with honey or syrup into a sweet confection. Apart from the plate attachment, the Universal mill can also be turned into a hammer mill, pin mill and stone mill simply through changing the milling heads and adjusting the speed in a very simple fashion.